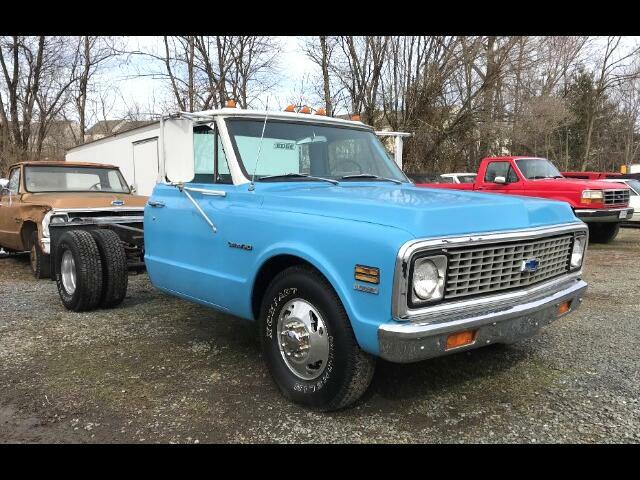 1971 Chevrolet 1 Ton Chassis-Cabs Reg Cab 135.5"
This is a 1971 Chevrolet C-30 one ton dually cab and chassis. This truck was stored away with car covers on it, that held the moisture in and caused the rust to form in the engine compartment. around 20 years ago, and was not started or run since then. It is equipped with a 350 cu in V8 engine, manual 4 speed transmission, power steering, power brakes and factory air conditioning and dual rear wheels... The truck has 33,000 original miles on it, however, the engine is locked up and will have to be replaced. Everything is there and the truck is complete, and un-altered. The truck has factory air conditioning, and cruise control, power steering and power brakes. There is some minor rust in the cab corners as you can see in the pictures. This is a project, but when completed, will make a super nice truck, to add whatever bed you want to put on it. Message: Thought you might be interested in this 1971 Chevrolet 1 Ton Chassis-Cabs.